CT Cranium: Two Multipads, one applied on the left side, the other on the right, stabilizes the patient’s head effi ciently in the head holder. The Velcro on the forehead can be waived. MR Cervical Spine: A single Multipad used as a neck cushion provides highest comfort as the volume can be individually adjusted, which is especially important for the elderly patients. MR Foot: A single Multipad inserted through the coil opening at the toes is placed on the back of the foot and therefore stabilizes the foot inside the coil. 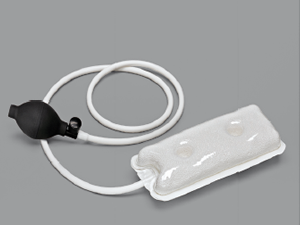 MR Shoulder: A single Multipad can be used to gently push the patient’s shoulder downwards.